Medical work began at the Methodist Mission in Chicuque, Mozambique when Dr. Charles Stauffacher arrived in 1913. The hospital was constructed the following year. Thus began a highly effective work of public health education, teaching midwives with the help of Victoria Lang, Clara Bartling and Alice Longworth. Miss Longworth later was married to Dr. Stauffacher after the death of his first wife. The midwives were sent into the Christian villages to deliver babies and to dispense medicine for malaria and diarrhea. They taught the people to dig latrines, secure safe drinking water, to eliminate breeding places for mosquitoes and to improve their diet. Patients with complicated problems the midwife couldn't handle were taken, whenever possible, to the hospital in Chicuque. Dr. Stauffacher visited these rural clinics at least twice a year bringing medications and other supplies. Often he rode on a donkey to reach remote areas. He died in 1974 in Chicuque and is buried there beside his first wife. Medical work was carried on by the African and missionary nurses. The nursing school continued and was expanded to provide well-trained African nurses for other mission hospitals, including those of the Free Methodist, Nazarene and Swiss Presbyterian churches as well as for Chicuque Hospital. From time to time doctors were contracted from Germany, Portugal, the United States and Mozambique on a short-term basis. When no resident doctor was available, seriously ill patients were taken, often by sailboat, across the bay to the government hospital in Inhambane. When my wife Nadine and I arrived in 1959 we found a group of dedicated, highly motivated Christian workers, eager to start a more aggressive medical program. The old hospital was inadequate to handle the large number of patients who began to come for treatment. By the ingenuity of Harry Greenberg, the mission superintendent at that time, an operating room and consultation rooms were set up in an old building which originally was a mule stable. Initially, I was permitted by the Portuguese government to treat only leprosy patients, but when numerous surgical patients began to arrive, I sent them all to the government hospital in Inhambane. Finally the resident doctor there said, "I thought the new missionary doctor was a surgeon. Why is he sending all these patients to me?" When I explained the situation, he saw to it that I was given permission to treat everybody. With the skill and hard work of Ann-Marie Korswing and Elsie Johannson, two Swedish nurses, and Reva Phelps, a highly trained staff of African nurses formed one of the best surgical teams I have ever had the honor to work with. The few hospital beds were quickly filled and the floor space taken up with patients on grass mats under the beds and between the beds. If weather permitted, we even had patients outdoors under the trees. It was strange to see an IV bottle hanging from a tree branch. It was soon apparent that the old hospital was inadequate for our needs. Plans were made to build a new, more modern hospital. Finally, under the direction of Rune Korswing from The Methodist Church in Sweden, with input from his wife Ann-Marie, our nursing supervisor, and the African and missionary staff, a new hospital was built with financial support from churches in the United States, Sweden and Bread for the World in Germany. The first building, designed in a U-shape, was constructed in 1965, providing space for administrative offices, a large waiting room and reception area, a record room, consultation room and laboratory and treatment rooms. Soon after, work began on three one-story medical and surgical wards for men, women and children. Across from the wards was built a large surgical building with two operating rooms, treatment rooms for minor procedures and two physician consultation rooms. With funds from Bread for the World of Germany a maternity ward was built with two delivery rooms, treatment rooms, beds for pre- and post-natal patients, a nursery with incubators. A room for a pre-natal clinic was included. The new hospital provided 150 beds, but we usually had about 200 patients; so we still had patients on the floor. People came from as far away as the capital city of Lourenco Marques (now Maputo), 300 miles to the south, and from Beira, a port city in the north. Chicuque Hospital became one of the principal rural hospitals in the country. The hospital's nurses and doctors saw approximately 60,000 patients a year, did almost 1,000 major surgeries and around 2,000 minor procedures yearly. The number of deliveries performed approached 1,000 annually. A large proportion of the deliveries were complicated in that most babies were still delivered in the villages. Women with complications were brought to the hospital. The medical work included a Leprosarium at Teles, five miles inland, and a clinic at Cambine Methodist Mission about 30 miles inland. Miriam Yu, a Chinese contract nurse, also joined the staff. She worked first in Chicuque before taking charge of the clinic in Cambine. The physicians made weekly visits both to Teles and to Cambine. The Nurses Training School, which had been housed in a small building once used as a residence, received a large new dormitory and an expanded teaching faculty. Through an agreement with the Swiss Presbyterian Mission, it became ecumenical. Marianne Gay, a Swiss Presbyterian nurse, became the director. United Methodist missionary nurses Victoria Lang, Ann-Marie Korswing, Elsie Johannson, Reva Phelps, Sharon Hatfield, Linda Quass, Jonnalynn Knauer and Dorcas Hough taught classes. Missionary physicians from both missions taught courses in anatomy, physiology and pharmacology. We then sought recognition by the Ministry of Health of the Portuguese government. After thorough inspection, we were approved. Nurses who had graduated prior to the government recognition were given extensive review courses and sent to the capital city for the nursing examination. They all passed and were officially recognized and registered as nurses, able to work anywhere in the country. Dr. Horst Flachsmeier from Germany, his wife Helma and their two daughters arrived in Chicuque in 1964. Dr. Flachsmeier was an ophthalmologist and set up an eye clinic. He performed large numbers of cataract operations and successfully performed several corneal transplants. He imported ophthalmology equipment and secured funds from Brot fur de Welt of Germany to construct the maternity building. He was on the staff from 1964 to 1967. In 1970 Dr. Bruce Broughton, a surgeon from California arrived with his wife Mary and three children, Carrie, Kathryn and Todd. Dr. Broughton worked in Chicuque, Teles and Cambine for five years. Soon after Mozambique was granted independence from Portugal in 1975 and the Frelimo government took over mission hospitals, Dr. Broughton resigned. Nadine and I were on furlough at the time and were not permitted to return as missionaries. 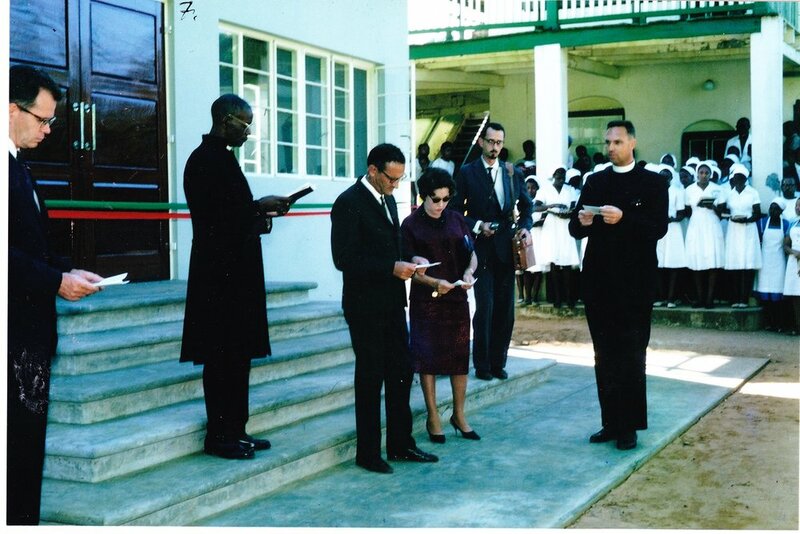 In 1985, the Mozambique government, through a change in policy, invited the United Methodist Church to resume the medical work at Chicuque and Cambine. I was a member of the delegation who met with government officials to explore conditions under which we could cooperate. We found the hospital to be seriously in need of repair and lacking in medications and supplies. The X-ray machine was not functional. Surgical equipment was lacking or in poor condition.In spite of the dilapidated condition of the hospital and lack of medications and supplies, the institution was full of patients. The African staff were doing the best they could to care for the sick and wounded. Fighting between Frelimo, the party in control, and Renamo, the resistance group, had continued for 10 years. After much discussion, it was decided that the Board of Global Ministries of the United Methodist Church would enter into a cooperative relationship with the Mozambique government. The government would continue its present level of support to pay salaries of the national workers and continue some funds for operating expenses. The hospital would remain a government rural hospital. The United Methodist Church would cooperate by sending missionaries from Europe and the U.S.A. An immediate grant of $100,000 from UMCOR was allocated for restorative work on hospital buildings. Funds for equipment, medications and other supplies were sent. Large shipments of equipment, beds, sheets, blankets and other medications and supplies were sent from Sweden and the U.S.A. Numerous United Methodist missionaries served one or more terms during these uncertain years. Dr. Marian Jones, a retired pediatrician from Billings, MT, worked in the hospital from 1988-91. Beth Ferrell, an RN from Ohio, served as co-administrator of the hospital for several terms. Carolyn Belshe from Texas, with administrative experience, established a home for orphan children at Teles, the previous site of the leprosarium. The home was later moved to Cambine station, 30 miles inland. Other short-term medical workers made significant contributions. Darla Rowley taught primary health care. Dr. Don Rudy worked in surgery for a month in 1989. Others were Paul Wolff from Germany and Dr. Emmanuel Mefor from Nigeria. Nadine and I returned for a visit in 1994, two years after a cease-fire had been declared between Frelimo and Renamo. Hostilities had ceased and economic recovery was beginning to take place under the presidency of Joaquim Chissano. In Maputo, the capital, there was still evidence of a depressed economy; electricity and a water supply were sporadic and roads were in poor condition. Chicuque Hospital was vastly improved from the time of my visit nine years earlier. Missionary nurse Beth Ferrell was co-administrator. The buildings were clean and well-kept. The nursing staff was adequate. Dr. Jagdish from India, working for the government, was in charge. A young Mozambican woman doctor was in charge of pediatrics and two medical students from Maputo were assigned to the hospital to gain experience in rural medicine. We were driven around on this visit by Jeremias Franca, a young Mozambican nurse, who was practicing his English. Through the contributions of churches in the U.S. and Sweden, Jeremias, his wife Ilda and their four sons went to San Marcos, Texas where he studied at Southwest Texas University. He obtained a degree in hospital administration. Upon their return, Jeremias became administrator of Chicuque Hospital. Under his leadership the hospital flourished and has become a shining example of how a Protestant mission hospital can cooperate with an independent African government and become the most outstanding rural hospital in the country. While surgery is now performed also in government hospitals in Inhambane and Vilanculos, Chicuque remains the principal rural hospital in Inhambane district, an area of 50,000 square miles.